The requirements for rubber in hoses are diverse, depending on the hose type, the product carried and requirements for filler layers and covers. Any hose can have more than one rubber compound type depending on its construction, specially formulated to give the required properties for the layer. 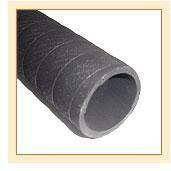 One essential factor in rubber hose is to achieve very high levels of adhesion to ensure maximum resistance to fatigue. The key properties for the hose are oil or fluid resistance, high resistance to aromatics, temperature resistance, fatigue resistance and ozone resistance. Fuel Hose: Fuel hoses are required to have extremely low permeability to fuel in order to regulate and lower hydrocarbon emissions. Mixed fuels like ethanol, methanol etc. require hoses with high resistance to polar solvents. Adding carbon blacks to rubber hoses reduces both permeability of gasoline and swelling of solvents. Radiator Hose: Radiator hoses are resistant to coolants at elevated temperatures. Industrial Hose: There are various types of applications of industrial hoses, including water and steam hoses, air hoses, oil and petroleum hoses, refrigerant hoses, and chemical hoses. Here also, strength and resistance to solvents and chemicals are key requirements. Fire Service: Fire hoses are one of the most recognized hose pipe in industrial usage as they are largely applied in Fire stations and Fire Brigades. The inside of the hose is composed with water resistant rubber compound suitable for the intended use. The cover is also made from rubber which gives outstanding resistance to heat and abrasion. Garden Hose: This is used to water plants in a garden or lawn or to carry water to a sprinkler for the same purpose. Air hoses: These hoses are used in underwater diving to carry air from the surface or from air tanks. Automotive hoses: These are used in automobiles to move fluids around for use in lubrication or cooling and in hydraulics. Design units: Design units can be English measurements like in inches or fractions of an inch, or metric measurements like in millimeters or centimeters. Inside diameter: The inside of the hose is the inside diameter. Outside diameter: The outside diameter is the normal specification for hoses of corrugated or pleated construction. Working pressure: This is the maximum service design pressure. Maximum vacuum: This is given in inches or mm of mercury referenced below one standard atmosphere. Minimum bend radius: This depends on a combination of acceptable hose cross-section deformation and mechanical bending limit of any reinforcement. Temperature range: This is the maximum required range of ambient operating temperature. Reinforced: Constructed with some element of reinforcement. Coiled: For flexibility and elasticity. Corrugated or convoluted: Contains corrugations, pleats, or spiral convolutions. Articulated: Rigid hose sections that are constructed with "joints" that can be positioned or articulated. Multi-element: This is more than one hose formed or adhered together in a flat, ribbon, or bundled configuration.